The more water we have in our pool, the more chemicals we need to keep it clean. When we mention chemicals that are used for sanitation, some people only think of chlorine but there is a battery of water balancers needed to help chlorine do its job. If one of these chemistry levels is out of whack then the others may be dragged down with it, causing dingy green water. For a thorough explanation of what each of these chemicals do and how to keep them in proper ranges take a look at our Pool Chemical Guide. The chart below shows chemical amounts needed for a pool that has been left unattended for a time. The starting point of the pool chemistry level is listed next to the target we want as pool owners of a traditional chlorine pool. The columns on the right calculate the amount of chemicals required to adjust a pool of 10,000 or 25,000 gallons to the target number. Obviously, the larger pool requires more chemicals to balance water levels, but also take into account the time needed to filter and turnover that water to mix the chemicals properly. These calculations were done using the PoolMath Calculator which is one of my favorite tools. It takes the guesswork out of pool water balancing. These chemical levels are typical of a pool just before spring starts or if you became lax in dosing your pool. A pool properly maintained will not require a big recovery project like the one listed above, but standard chemical costs are a constant expense throughout the pool season. 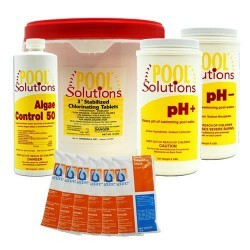 The cost of pool chemicals varies according to area. So when weighing possible expenses of owning a pool, call local pool supply stores for costs. Feel free to play with the PoolMath Calculator to figure out dosages as well. One thing about small pools I should mention is that the chance of overdosing your pool increases. However, an overdosed small pool is fixed with draining a portion of the water and refilling with fresh water. It is easier to add more chemicals than to remove them. Smaller pools allow for smaller, less expensive pumps and filters to be installed without compromising water quality. If you have a 10,000 gallon pool, there is no need for a 3 horsepower pump. We suggest using a ¾ or 1 horsepower pump for a pool that size. If you want to know an appropriate size for your pool filtering system, take a look at our Pump and Filter Sizing Guides. Installing a smaller pump saves money upfront on the new purchase and long term in repairs. Motors and impellers will need to be replaced with any pump, but with smaller equipment the costs are incrementally reduced. The same replacement costs can be applied to sand, cartridge and DE filters, because you will need to buy less sand or smaller cartridges. Have you ever tried to skim and scoop a 20′ X 40′ pool for willow leaves and pine nuts? Depending on your patience, your irritation can range from not having fun to feeling that you should sell this house. The dirt, grit, and debris will find its way into every nook and cranny of your pool, like an 8-foot deep English muffin. Robotic and suction pool cleaners are great help, but for heavy debris they can become clogged or require repeated cleaning before a cleaning cycle is completed. When you choose a small pool, you’re choosing free time over cleaning time and I applaud you for it. Not everyone has a sprawling backyard in which to construct a temple to the pool gods. A house with restricted backyard space requires a pool to be fitted to specific parameters, but I suggest you ensure that it is not at the expense of pool deck space. If you shoehorn a pool to occupy the majority of your cramped backyard, you may regret the lack of space to walk around for those non-pool parties (if there is such a thing). 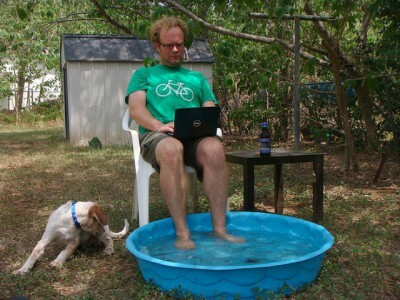 Even the more avid pool owners spend the majority of their time around the pool rather than in it. So, do not think of it as sacrificing pool space for more deck room, but rather making room for a cool barbecue or a fire pit to accessorize your pool area. More space gives you more options. A pool is a hub for family fun and friendly get-togethers in the summer, but unfortunately not every prospective homeowner wants one in his/her backyard. Prospective home buyers may skip over a house listing if it features a pool or one that is larger than average. 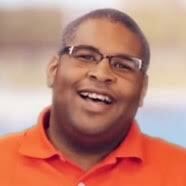 Homeowners who are new to pools may be hesitant to dive headlong in maintaining a 25,000-gallon pool whereas a small pool may intrigue buyers who want a “starter pool” or need one for therapeutic reasons. If you are considering installing a pool to increase the value of your house, stop and do some research. Depending on your area, the addition of a pool to a property may increase the value of your house less than half of what the pool will cost to install. And again, your new addition may shrink the pool of buyers making it a tad harder to sell on the market. Pun intended. Thank you. Great article. Very helpful.